Does social media have a role in high street banking? US banking giant Citi has taken its stateside Twitter presence one step further, launching a new account to deal with customer complaints. Could the UK banking sector benefit from such social media customer service? Or maybe you think that any banks using social networks is just a cynical ploy, rather than a genuine attempt to improve customer service? 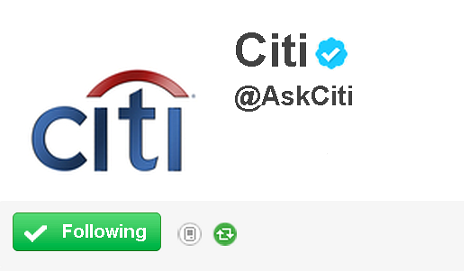 Citi, which owns internet bank Egg in the UK, is making a brave move with its @AskCiti Twitter account. Any bank that puts its head above the parapet and encourages public complaints in the current climate deserves praise. So maybe UK banks could take a leaf out of Citi’s book? Tweeting banks good news for all? An increased use of social media by banks could be a win-win. We could hopefully get a faster response by ‘direct messaging’ a dedicated Twitter account, cutting out frustrating time spent hanging on the phone, waiting for the postman or being fobbed off in-branch. Meanwhile, banks are seen to care, can increase their own brand awareness and, most importantly, are better able to keep their customers happy more quickly. Banks aren’t stupid. An increased use of social media will partly be used to keep down their formal complaint figures. This isn’t necessarily a bad thing – if the bank sorts out your query on first contact, there’d be no need to complain in the first place. And dealing with complaints via Twitter should not deny us the right to take our complaints to the Financial Ombudsman Service (FOS). This is because, in most cases, you can take your case to the FOS eight weeks after you first complain to your bank. In the end, how you complain to your bank in the first instance isn’t important – whether it’s by phone, in writing, or theoretically, through Twitter. Then again, putting a complaint into 140 characters isn’t going to be easy as you’ll need to give the bank enough information to investigate your problem. Citi seems to be taking a sensible middle-ground by encouraging its customers to direct message it with a convenient time to be called on the phone. From the customer’s perspective, social media can offer a quick (and public) way of getting an answer. And if your 500 Twitter followers can see you complaining, it’s in a company’s best interests to fix your problem fast. Citi’s move is to be welcomed and I look forward to the initiative transferring across the pond so we too can have an extra route to fix our banking problems in the UK. In the meantime, why not follow us instead – @WhichMoney, @WhichConvo and me @MartynSaville. That wasn’t subtle at all. Do automated customer service lines wind you up?